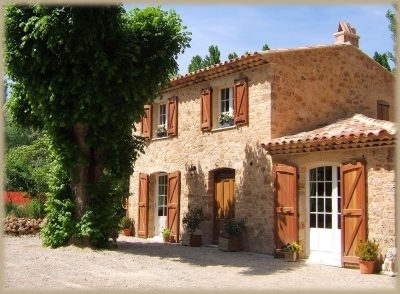 Exquisite, tastefully renovated stone vacation rental cottage, offering all the charms of Provence. Sleeps 4. Two double bedrooms and two bathrooms. The cottage Accommodations is completely secluded from the main property set in 2 acres of grounds, yet in easy walking distance of the pool, yoga area and other facilities. 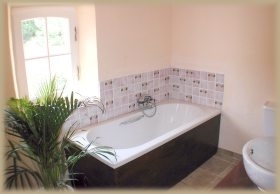 Spacious, open-plan, fully-equipped kitchen (dishwasher, large fridge/freezer, washing machine). Living room full of character with a wood-burning stove and exposed beams television and CD player available. Delightful covered terrace with spectacular views. Outdoor furniture with BBQ. The two well-appointed bedrooms and one of the bathrooms: Main bedroom with beautiful antique furniture and king-sized bed. 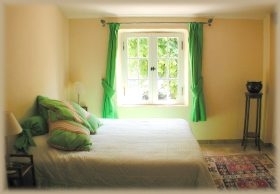 2nd bedroom with twin beds which can be converted to double bed.